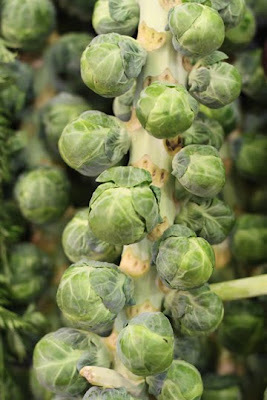 Have you ever wondered where brussel sprouts come from? Like, do they grow in a bunch? Or do they grow on a bush? Well, turns out they sprout from a stalk. I had a photo shoot this afternoon (more of that to come and some absolute gorgeousness of a goddess friend) and then had to go to the grocery store. Our Scion is a hatchback, so there's no trunk to hide expensive gear in. And I've had a camera bag and contents stolen, smash and grab style, right out of my car in the middle of the day. Anyway, so I just strapped the camera on me and went into the store. As I was walking around I started thinking I should be taking pics of all the food and displays, different colors, textures, all kinds of stuff. Usually when I'm in the grocery store my main goal is to get the hell out of there as fast as possible. And then I wondered, if I'm taking pics will the store people get pissed? Will other people look at me weird? First, I don't think the store people would care and if they did, I would stop. As far as other people, so what?? Let them look at me weird. If I really want to be present with photos then I just need to go for it. But in the interest of time, since I had been out pretty much all day, I decided no pics, just get the groceries and get home. Then I saw the brussel sprouts and had to get a shot. I've never seen anything like this. The stalks were about a foot to a foot and half long. It makes me want to try them but I'm certain I need a good recipe. And beyond everything else, so if this is a brussel sprout, does it grow into a big brussel? Is the plant called a brussel? Guess I got some googling to do.